The AficioMPC400/MPC400SR are productive, user-friendly solutions that are exactly what your office workflow requires. 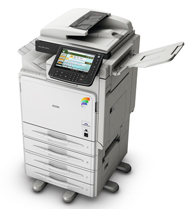 These compact colour multifunctionals copy, print, scan and fax efficiently and at high speed, with automatic duplex printing as standard. The MPC400SR even staples your documents automatically. For maximum user convenience, the large colour touch-panel can be tilted to improve visibility. These devices smoothly integrate into your existing network and offer a low Total Cost of Ownership thanks to Quick Start technology and low power consumption. Print from USB memory or SD card. Excellent productivity: 40 pages per minute. Highly customisable via App2Me and Ricoh Widgets. Low Total Cost of Ownership.